Sometimes the simplicity of the Message comes through an inconvenient task. For the last two days I've had my niece and her family with me. She has two precious little girls with a lot of energy. The little one, Payton outran my cats Mercy, Grace and Savannah. She chased them as she discovered with excitement that these four legged furry creatures could run around the house just like her. Of course the cats were terrified and hid in my room for 48 hours. I guess they felt threatened by a "little person". We had dinner together and enjoyed each others company. Payton ran outside collecting "little yellow flowers" a.k.a weeds and put them in a jar. It kept her busy and it was a game to see how many she could get; I have a lot of weeds. I convinced Meyli the older sibling that collecting ants and putting them in a jar could actually be fun; also a time of discovery and removing the fear of small insects that are outside. My niece knows I serve the Lord. When she was a little girl I used to bring her to church with me. Great memories. So as they get ready this morning, I said "goodbye" and left first because I was on my way to work. I reminded them to close the door behind them and not to let the cats out. As I was just arriving at work I get a call. It's my niece letting me know that they are all packed and outside ready to venture back down South. Her voice seemed a little "off". I asked her "what's wrong?" Well, in all the packing and getting ready they accidentally locked themselves out of my home leaving their car keys inside. My heart sank because I had just arrived at work; a 30 minute drive. There was no other access to my home. I even gave them permission to break in through a window but to no avail. 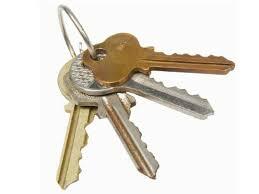 If you want to get into my house you need a key! Scripture tell us that Jesus is the Living One who was once dead but now lives for ever more! Revelation reads, "I hold the keys of death and Hades". At the cross where he was crucified, a very extravagant love paid for the sins of the whole world. So with no other option, I get in the car and head all the way back home. As I arrived we kind of laughed and opened the door with my key. My niece and I had a good chat, something we did not do in the two days we were together. We prayed and once again I was able to share with her about the Lord. What seemed like an inconvenience was actually a God ordained moment! Praise the Lord! Stephanie, I hope you are reading this. I love you, but remember Jesus loves you more. Please take to heart our conversation, I promise He is real and he loves you. He is not a genie but the Creator of the World who desires a relationship with you! Read the book of John and ask God to reveal himself to you. What causes us to fret? Could it be that sometimes our own anxieties or troubles are brought on upon ourselves? Have you ever opened your eyes in the morning and the first thing on your mind is the day’s to-do list? Now, shouldn’t it be Jesus? Instead of waking up and saying “thank you Lord” for a new day, sometimes our thoughts are more like, “uhhh look at all I have to do today”. If that’s not bad enough our great invention of trepidation beeps with just one more thing for us to do! It really is a “cell” phone; a prison at times. Jesus said, ” Take my yoke upon you, and learn of me; for I am meek and lowly in heart: and ye shall find rest unto your soul”. This Scripture is so often quoted but how many of us are actually at ‘rest’ today? Jesus’ words draw me; meek and lowly. In other words, quiet, gentle, yielding, submissive, not wanting to fight or argue. A place of rest and harmony; Jesus is Peace! I think when we have too much on our “daily plate” we become grouchy and resistant to “rest”. It’s as if I am in a race, but with who? Sometimes we are racing the world and all its imposed deadlines to earn a prize of recognition. Who are we trying to impress? I like the MSG translation that reads, “learn the unforced rhythms of grace”. Who are we trying to impress? What are we trying to win? What unrealistic goals are we trying to notch off the list? We often wrestle with the “rat race” of the world and wonder why we are tired and worn out. “Hey world, I am not a rat and I will not run on the wheel!” Unfortunately, sometime the Lord has to push me off! The “rat race” in my definition is not just an endless financial pursuit but anything that is consuming us to spend all our resources to a fruitless end. Did you know that there is a “stress awareness month”? Yep, it’s April. Great, one more reminder on my cell phone! Ok, back to what Jesus said. Today when I read the words “meek and lowly in heart” I once again realized that Jesus is not trying to impress anyone. When we operate like the world, naturally we have to “prove something”. We have to let the world know who we are. But, the truth is Jesus already knows who we are. We are weak, at times frustrated; we operate in pride and put ourselves into unrealistic schedules and races. We are the adopted sons and daughters of God! Let's REST in that! He is calling us to rest; to breathe and enjoy the earth and relationships he has given us. Pride chants, “do it” and “reach it”, “push yourself”. Humility says, rest and ask for help. The children of God are to work together in His Kingdom. So, take a mirror; better yet, turn on your cell phone’s camera :) and invert the image. Yep, your personal mirror. Remind yourself,” I am a child of God. I do not have to prove anything to this world. I can operate to the “unforced rhythms of grace”. Thank you Jesus for reminding me again and pushing me off the “wheel”! 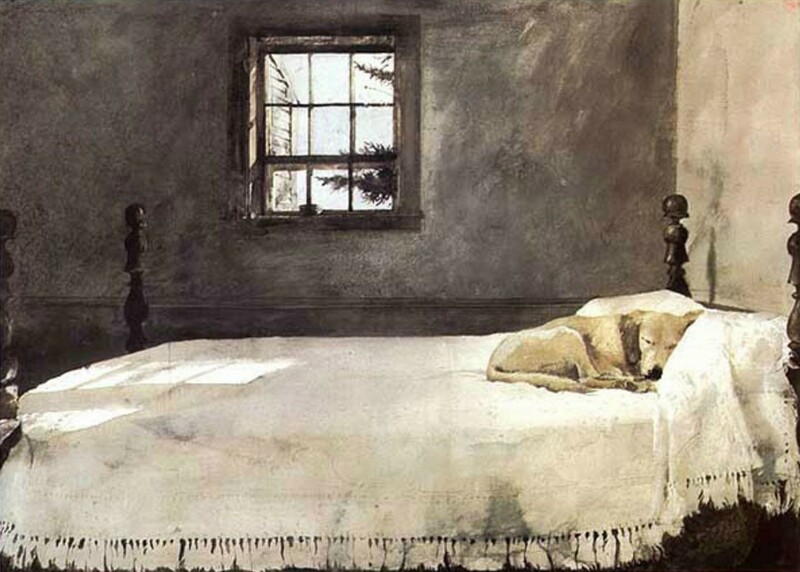 I love the painting above by Andrew Wyeth. I saw this many, many years ago. Such tranquility in this humble setting. REST my friends, REST. Run, run, run, that's the race we are in! Tomorrow I have participated to be the "cheering squad" with my husband for a 5K race that's being held in Goshen, NY. Though I have physical challenges I probably could have walked the 5K but I volunteered to encourage the runner/walker. Why? Isn't life just like a race? You're walking or running and then something tries to intercept your stride. Just when you think you are about to arrive a curb ball come your way. It might even knock you down. The Bible says, "for though the righteous fall seven times, they rise again." (Proverbs 24:16). So let's go walking and if able let's run! I will let my mouth cheer the runner tomorrow. I will encourage the one running the race to finish just like Jesus does to us. I hear we might even have snow; this is April, right? Well, if is snows we'll make a snowman and place a sign on him that reads, "press on toward the goal." It will be a great event to have participants persevere!. Let God be praised! So, come on; get your sneakers ready, we are running the race! I don't know how it actually begins; the beating of the heart and soul of a life. Many have argued the actual genesis of life; views from every possible angle. Today I am just going to consider my life since I am the only expert on that subject. God, the Designer of Life has saw fit to bring this soul to life; to give me breath. When we are young in years we often don't contemplate purpose; at least I didn't. About two decades plus ago I came to an intersection that has changed my life. I surrendered my life to Jesus. This experience set my feet in a direction, an experience that I am still exploring. I have been saved, set apart for God and continue to mature in this thing I call "life". God who knitted me together and caused my heart to beat and then again my life to be made new--He is guiding me. I'm not sure I always listen; not sure I fully get it right all the time. But today I rejoice for the mercy and grace of God; for the hovering of the Holy Spirit who never gives up on me and is the source of my comfort and strength. Not sure if you guessed it yet? Today is my birthday. Yeah!!! I excel in the midst of others who love life. I like challenges but admit that sometimes they are painful, ouch! Literally today, I begin a new adventure, a new road; a desire that I've had for a long time but never pursued it. I often find myself in the middle of conversations where the only answer I have to offer for life's troubles is from the Word of God. A little afraid of further commitments to an already "full plate" ; I have decided to begin a new journey; taking new steps on a new road. Pray for me as I begin studies to achieve a certification as a Christian Life Coach. I'm excited for the challenge and the accountability to complete the task. So, Happy Birthday to me! Holy Spirit be my guide and direction.